-Stir together the flour, baking powder, salt and sugar in a large bowl. -In another bowl, beat the egg, then beat in the milk and oil. Pour this wet mixture into the dry mixture. - Mix batter lightly until moistened but still lumpy. Gently fold in one cup of blueberries. 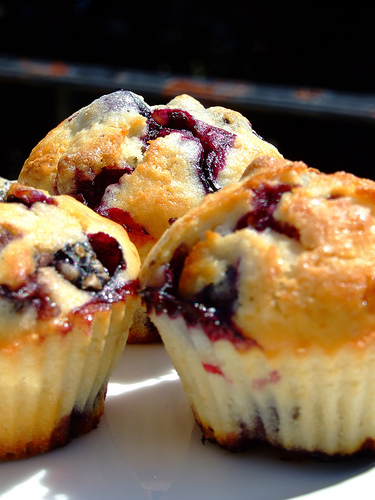 -Pour the batter into a lightly greased muffin tin, filling each cup about 2/3 full. -Position an oven rack in the middle of the oven and place muffin tins on the rack. -Turn the oven to 400' F (205' C). Bake for 20-25 minutes, or until golden. Makes 12-16 muffins, depending on the size of your muffin tins.